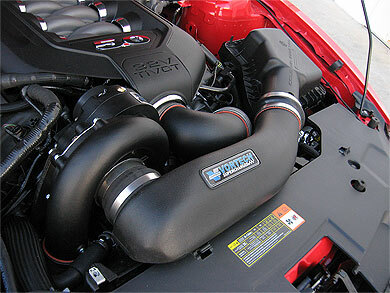 The complete system will boost a stock 2011-2014 5.0L Mustang to 605HP and 473 lb/ft torque. Systems are available with a black powder-coated finish as well as satin and polished. 10 psig @ redline on stock engine. 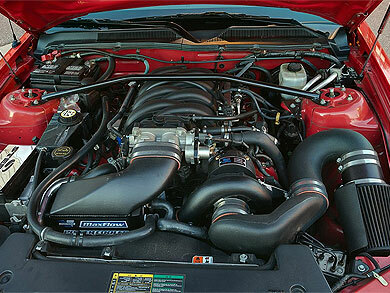 Complete systems and tuner kits are available. 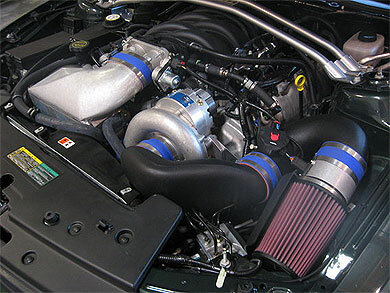 The High Output complete systems boost stock 2007-2009 vehicles to 462HP. 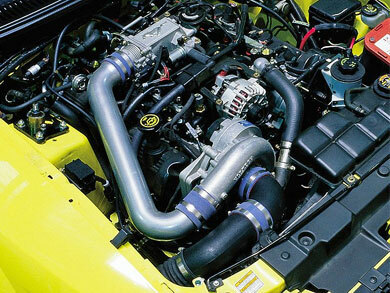 Complete systems and tuner kits are available. 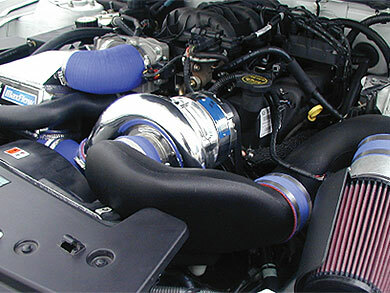 The High Output complete systems boost stock 2005-2006 vehicles to 462HP. Safely increase your GT's horsepower from 260 to 402 and torque from 302 lb./ft. to 400 lb./ft. Available with V-3 internally lubricated supercharger. 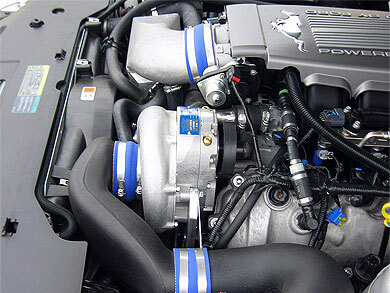 The increased boost level, high output supercharger system, features a fully integrated air to water aftercooler approach to charge cooling. 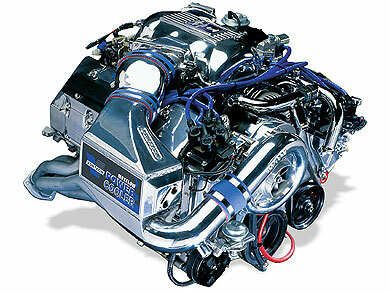 This system will increase horsepower from 260 to 402 and will increase torque from 302 lb./ft. to 400 lb./ft. Charge-cooled systems require a battery relocation kit, 8N150-010 (sold separately). 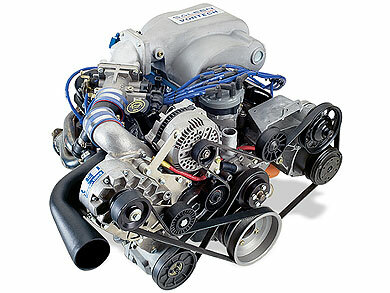 Safely increase your GT's horsepower from 260 to 364 and torque from 302 lb./ft. to 371 lb./ft. The addition of the V-2 Si supercharger with charge cooler will increase horsepower from 215 to 323 and torque from 265 lb./ft. to 365 lb./ft. at 9-10 psig at the flywheel. Increase horsepower from 215 to 319 and torque from 285 lb./ft. to 370 lb./ft. at 6-8 psig at the flywheel. 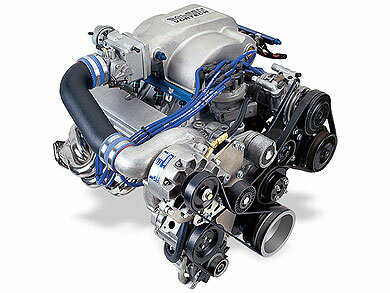 The V-1 Ti is available for those looking for high horsepower applications. The standard, entry level 5-6 PSIG, V-3 SCi model is perfect for the budget minded enthusiast. 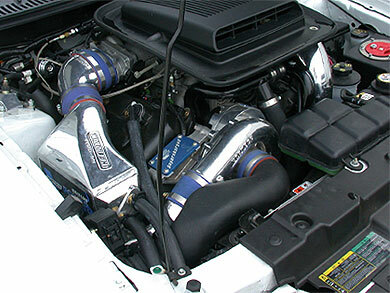 V-3 Si 7-9 PSI high-output charge cooled systems are available in black finish. 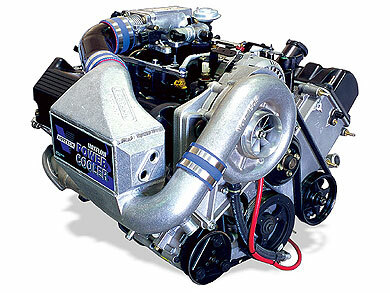 No POWER ADDER company produces more products for the 86-93 Fox Body Mustang than Vortech. For more than 20 years, we have demonstrated our product leadership with our wide range of super-efficient centrifugal superchargers. 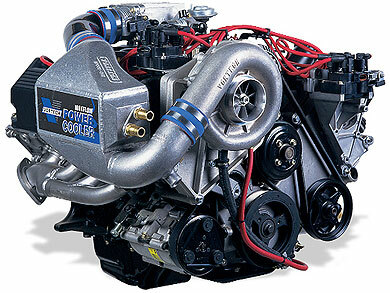 From complete 6-psi starter systems to full-blown (literally) 2000+ horsepower V-20 series superchargers, Vortech has you covered. Safely increase your Cobra's horsepower from 305 to 442 and torque from 285 lb./ft. to 390 lb./ft.. The addition of the V-2 SQ Si supercharger with charge cooler will increase horsepower from 265 to 415 and torque from 305 lb./ft. to 402 lb./ft. at 9-10 psig at the flywheel. The addition of the V-2 Si supercharger with charge cooler will increase horsepower from 305 to 484 and torque from 320 lb./ft. to 420 lb./ft. at 9.5-10.5 psig at the flywheel. 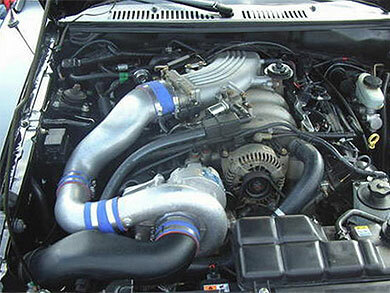 Increase horsepower from 210 to 330 and torque from 240 lb./ft. to 337 lb./ft. at 10 psig at the flywheel. Available with the V-3 Self Lubricating supercharger.